Wingspan 4.5 to 6 mm. 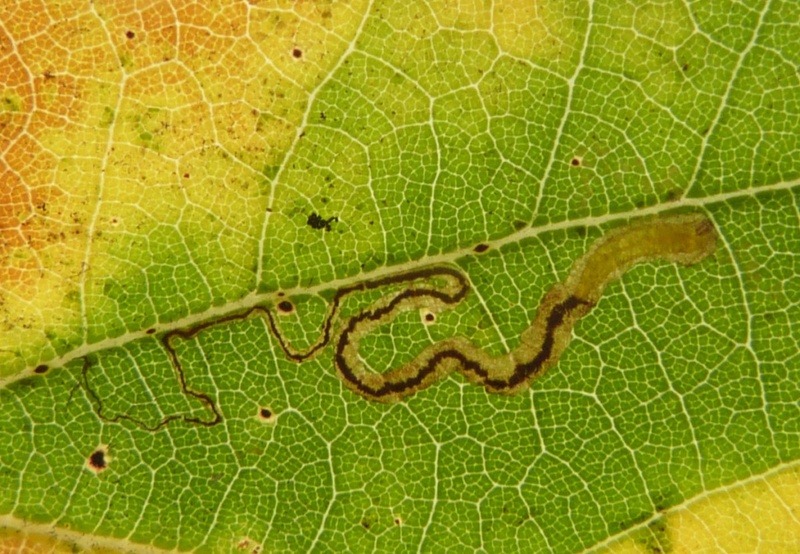 Stigmella atricapitella has a black head and dark brownish wings with a bronzy sheen. The larva mine the leaves of various oaks in two generations. The first generation produce a short gallery with frass in thick line. The second generation mine is a longer gallery with the frass in a narrower line. The larva is a whitish-yellow and has dark prothoracic sclerites (which help distinguish it from S. roborella, with a pale head only). Larva mines leaves of Oak, over-wintering as a pupa. Fairly common throughout much of the British Isles. In the Butterfly Conservation's Microlepidoptera Report 2011 this species was classified as common. It appears to be uncommon or under recorded in Leicestershire and Rutland, where there are few records. L&R Moth Group status = D (rare or rarely recorded).